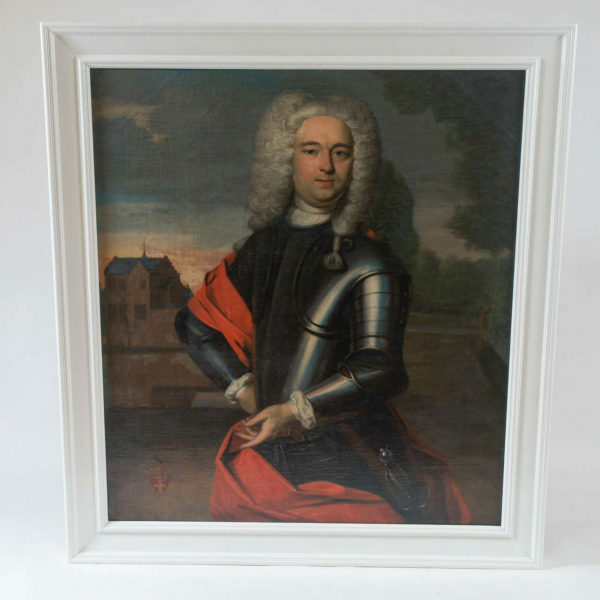 Exceptional portrait painting of a bewigged Dutch statesman in armor having architectural background of ancestral seat with heraldic crest at lower left. Later inscription to the reverse of period relined-canvas giving information of the dignitary: 'Jonkheer Derck van Lynden tot Swaanenburgh geb. 5. 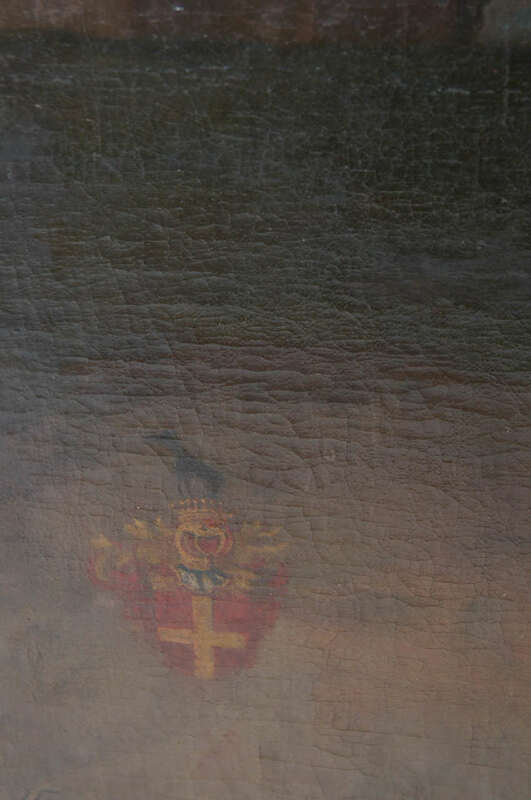 Juli 1733, vermahlt 18 May 1756 mit Cath. Lucia Pater gest. 1791. 1776 u. 1784 President d. Holland General-Staaten'. 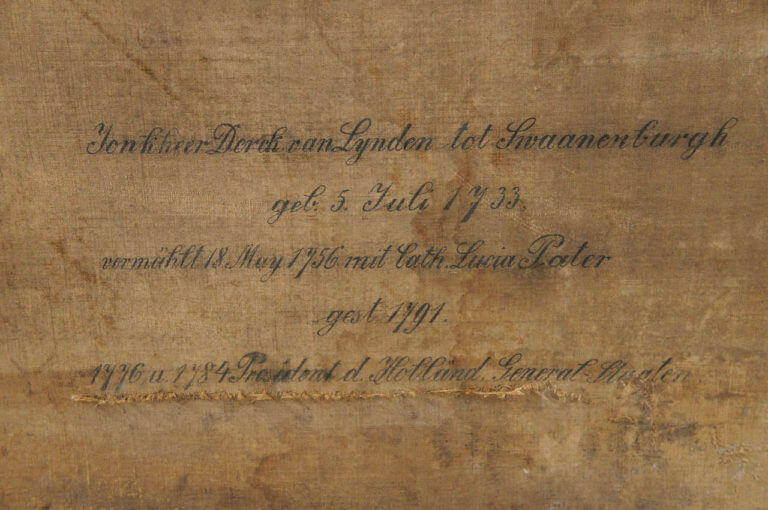 Translating from Dutch to English 'Young Lord Derck of Lynden at Swaanenburgh born July 5th, 1733, married Catherine Lucia Pater May 18th, 1756 and died 1791. From 1776 to 1784 was President of the States General of the Netherlands'. 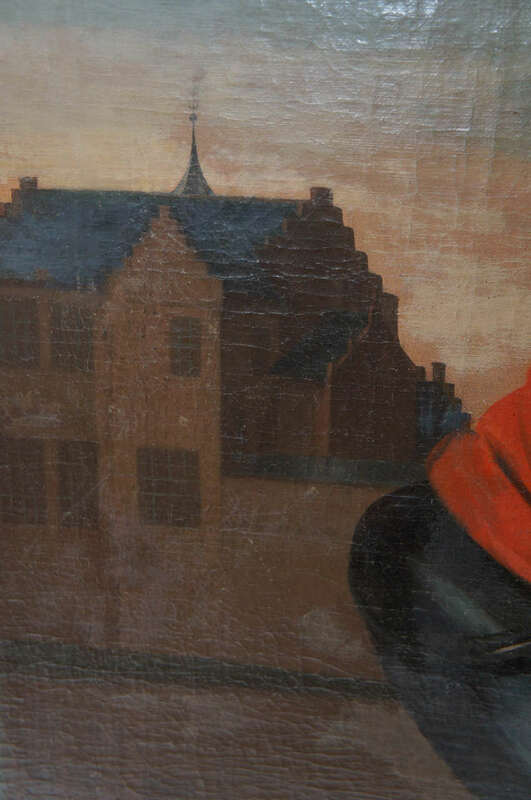 Even though painted circa 1760, he is portrayed in 17th-century style, which was a fashionable representation for 18th-century Dutch nobles, suggesting the power of the Dutch Golden Age. Canvas measures 40.63" wide by 46.25 high and is housed in a contemporary high-quality white lacquered solid wood frame. Good. Canvas with minor in-painting. Presents beautifully. 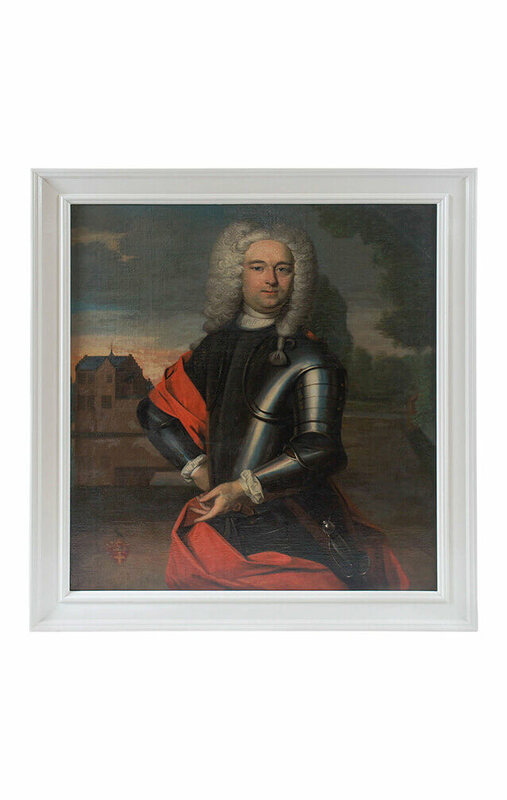 Exceptional portrait painting of a bewigged Dutch statesman in armor having architectural background of ancestral seat with heraldic crest at lower left. 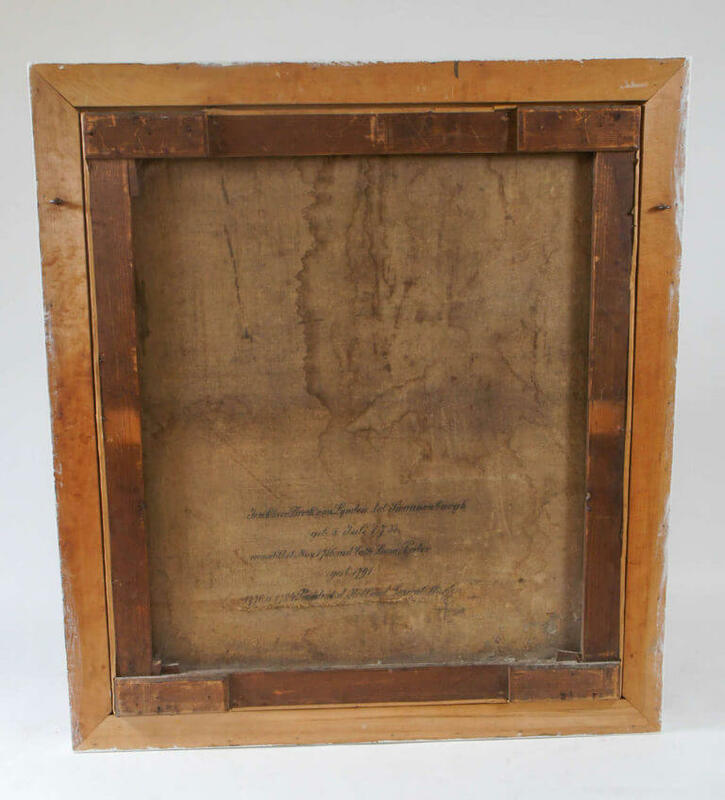 Later inscription to the reverse of period relined-canvas giving information of the dignitary: ‘Jonkheer Derck van Lynden tot Swaanenburgh geb. 5. Juli 1733, vermahlt 18 May 1756 mit Cath. Lucia Pater gest. 1791. 1776 u. 1784 President d. Holland General-Staaten’. Translating from Dutch to English ‘Young Lord Derck of Lynden at Swaanenburgh born July 5th, 1733, married Catherine Lucia Pater May 18th, 1756 and died 1791. From 1776 to 1784 was President of the States General of the Netherlands’. 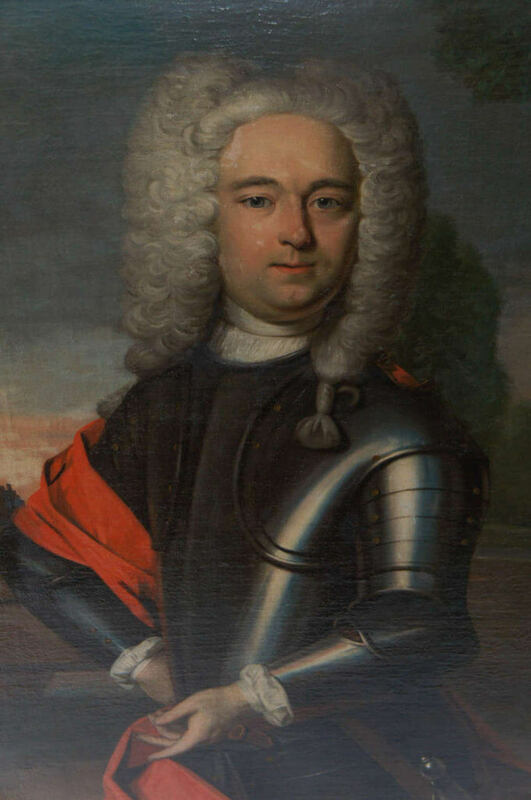 Even though painted circa 1760, he is portrayed in 17th-century style, which was a fashionable representation for 18th-century Dutch nobles, suggesting the power of the Dutch Golden Age. Canvas measures 40.63″ wide by 46.25 high and is housed in a contemporary high-quality white lacquered solid wood frame. Condition: Good. Canvas with minor in-painting. Presents beautifully.